Sea, water, sun, salt, and sand: how to treat your skin after a day of irritation. What is more wonderful than a day at the beach? There may be nothing more relaxing, rejuvenating, or as mentally recharging as a beautiful day spent out in the sun with the sound of the ocean and the smell of the salt water in the air. There is a reason why the beach is one of the top vacation destinations and why people of all ages swarm to the coastline summer after summer. With your body basking in the sun, what could go wrong? Well, from your skin’s perspective, many things could go wrong with even just an hour at the beach. The sun isn’t any stronger at the beach than it is anywhere else, it is just that you are more likely to burn at the beach thanks to the nature of swimwear and the complete lack of shelter. With so much exposed skin, barely a building in sight, and plenty of water to wash off your sunscreen, it is no wonder sunburns are such a prevalent outcome of a day spent on the shoreline. While the rest of your body may be feeling great after a day at the beach, it is a good idea to give your skin a little extra care following your time in the sand. 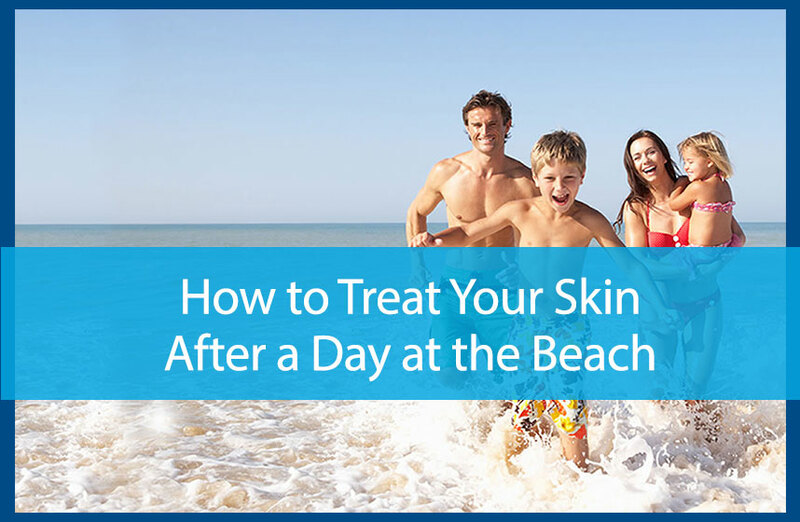 The beach offers up the perfect combination of potential irritants for your skin. Between the salt water, the sun, and the sand, you will owe your skin a little TLC if you want to really enjoy that fresh summertime glow. Stay hydrated. The sun dries out your skin, and the only way to restore that moisture is to drink a lot of water. Soda, coffee, and tea don’t do the job that water does when it comes to hydration, so when you get home from the beach, try to drink an extra glass of water to help re-hydrate. Moisturize. In addition to drinking lots of water, hydrate your skin with an aloe-based moisturizer. This will soothe any potential sunburn that is present and will help cool your skin, dulling any irritation that may start to cause you discomfort. Keep it cool. Avoid taking a hot shower or a hot bath after a day out in the sun. A cool shower will help reduce swelling, which in turn reduces irritation. If there are any particularly problematic areas, you can also help reduce swelling with a cold compress. The best thing you can do for your skin is to be proactive. Put on sunscreen before you leave the house and reapply every 30 minutes while you are outside. Wear protective clothing, like a hat or cover-up, if you are going to be in direct sunlight for an extended period of time. Finally, when you get home, don’t wait to start treating your skin. The sooner you moisturize your skin, the better off you’ll be. For more information on treating your skin ailments, make an appointment and contact us at 770-251-5111 today. https://availdermatology.com/wp-content/uploads/2017/07/Dayatthebeach.jpg 560 858 John Lenz /wp-content/uploads/2017/08/logo.png John Lenz2017-07-17 15:54:542017-10-04 17:30:04Sea, water, sun, salt, and sand: how to treat your skin after a day of irritation. Pros And Cons of Washing Your Face with Bar Soap What is the Best Way to Treat Facial Sunburns?